Pinkas (Philip) Spinat was born in Lancut, Poland, on 1st November 1896. He became a wool merchant. In 1922 he married Sara Goldstein, born in Kolomya, Poland. The couple moved to Frankfurt-am-Main, Germany, where their four children were born : Frieda or Friedel (b. 25/04/1923), Meta or Malka (b. 01/03/1925), Leo or Eli (b. 17/06/1927) and Doris or Dodi (b. 13/04/1930). In 1937 Pinkas Spinat tried to purchase false papers for his family to leave Germany, but he was caught and the Nazis tried to arrest him. In December the Spinats were able to reach Luxemburg, and from there, Belgium, where they settled in Antwerp. In May 1940, during the German invasion, Pinkas, Sara and the children tried to flee and even reached Calais, where they were refused entry into the United Kingdom because of their Polish passports. In June 1940, the family returned to their home in Antwerp. On 26 August 1940, Pinkas Spinat was arrested by the German occupying forces in Mons, Belgium, and was deported to the prison in Frankfurt-am-Main for trying to purchase the false papers for his family back in 1937. In 1942, he was transferred to the prison in Antwerp, thanks to the intervention of a befriended lawyer in Frankfurt-am-Main. Sara and the children were allowed to visit Pinkas a few times. In the summer of 1942, oldest daughters Frieda and Meta and son Leo received a convocation for forced labour (Arbeitseinsatzbefehl). Leo was sick and stayed at home, but the girls presented themselves at the Dossin barracks in Mechelen on 27 August 1942. Neither survived deportation to Auschwitz-Birkenau via transport VI on 29 August 1942. According to the Auschwitz death records, Frieda perished on 17 September 1942. No trace of Meta was found in the remaining fragments of the camp records. When, in autumn 1942, Pinkas was sent back to the Frankfurt-am-Main prison in Germany, Sara, Leo and Doris went into hiding. They shared a hiding place with dozens of other Jewish men, women and children. In February 1944, all Jews hiding at the address were arrested when the man responsible for the gas meter noticed the huge amounts of gas used for cooking were used in the house. Doris and the other seven children under 15 hiding at the house were sent to a Jewish orphanage, while the adults including Sara and Leo were taken to the Dossin barracks. Sara Goldstein did not survive deportation to Auschwitz-Birkenau via Transport XXIV on 4 April 1944. On 7 February 1944, Pinkas Spinat had been deported from the Frankfurt-am-Main prison to Auschwitz-Birkenau. After liberation of the camp, he was sent to a hospital in Krakow to recover, where he was reunited with his son Leo who had been deported via Transport XXIV and who survived the camps, but who suffered from severe tuberculosis. When Leo Spinat died in his father’s arms, two months after the liberation of Auschwitz-Birkenau, on Passover 1945 (29 March 1945), Pinkas was able to bury his son at the Jewish cemetery in Krakow. Pinkas Spinat then returned to Belgium where he was reunited with his only surviving child, Doris. Doris had survived the war living in several official orphanages, including one in Aische-en-Refail, and had spent the last weeks before liberation – when the official orphanages led by the Jewish Association of Belgium were no longer safe – in hiding with the catholic Goffinet family in Péruwelz. Pinkas and Doris Spinat returned to Antwerp. On 24 May 1949, Pinkas remarried the widowed Frajda Kersch. While Doris migrated to Israel in 1949, married Isaac Toledano in 1952 and had children and grandchildren, Pinkas and Frajda remained in Belgium, where Pinkas Spinat passed away on 2 December 1959. Before going into hiding in the autumn of 1942, Sara Goldstein entrusted several religious objects and family photographs to a befriended Belgian woman who ran a small grocery store not far from the house where the Spinat family lived. This woman continued to sell food and other necessities to the Spinat family even when this became dangerous because of the anti-Jewish laws. She also visited Doris at the orphanage in Brussels after Sara Goldstein and her three oldest children had been deported. After liberation, the Belgian, until today unidentified, woman returned all belongings to Pinkas and Doris Spinat. Doris took most of the photos with her to Israel in 1949. Her daughters Jude Wertheim and Irit Abir donated 29 original photographs to Kazerne Dossin in 2017 and added 5 more in 2018. 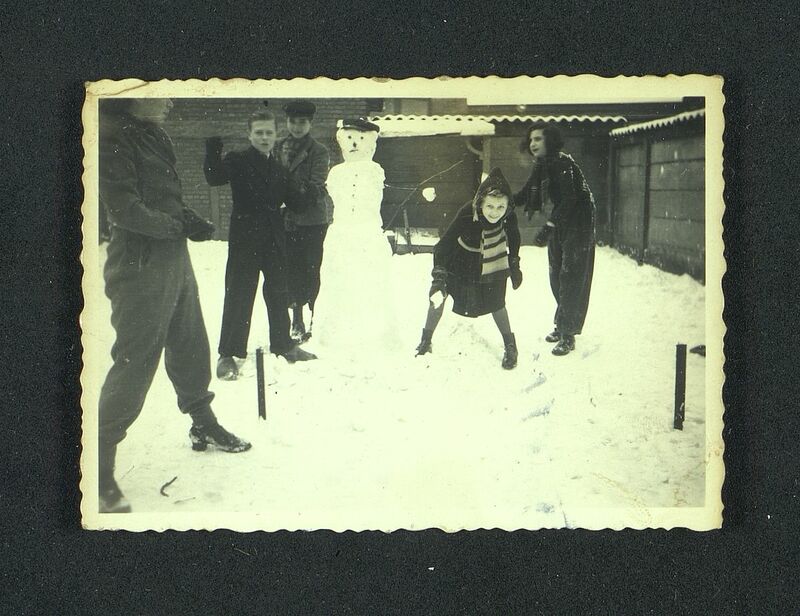 The five photos donated in 2018 depict life at the La-Bas children's home in Aische-en-Refail and are probably copies obtained from other archival institutes.